My friend and I decided to stop by Terra Mia the other night, hoping to not have a long wait and to have some good pizza. Score! On both accounts. Normally there is a decent wait here--it's a small but very busy place with outstanding food, and well worth waiting for. We entered and our name was taken, but second on the list. Then we were asked if wanted to sit at the counter--sure! We were lucky to get two seats right at the counter with a great view of the kitchen. Now in truth, there was not a huge amount of room on the counter, but we managed, just fine. Our server, Victoria, was extremely competent, friendly, and quick! Within minutes we had our drink order and were ready to order. Changes to the menu? No problem! 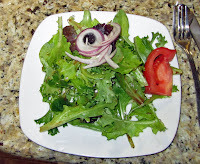 I started with a small side salad which was delicious! 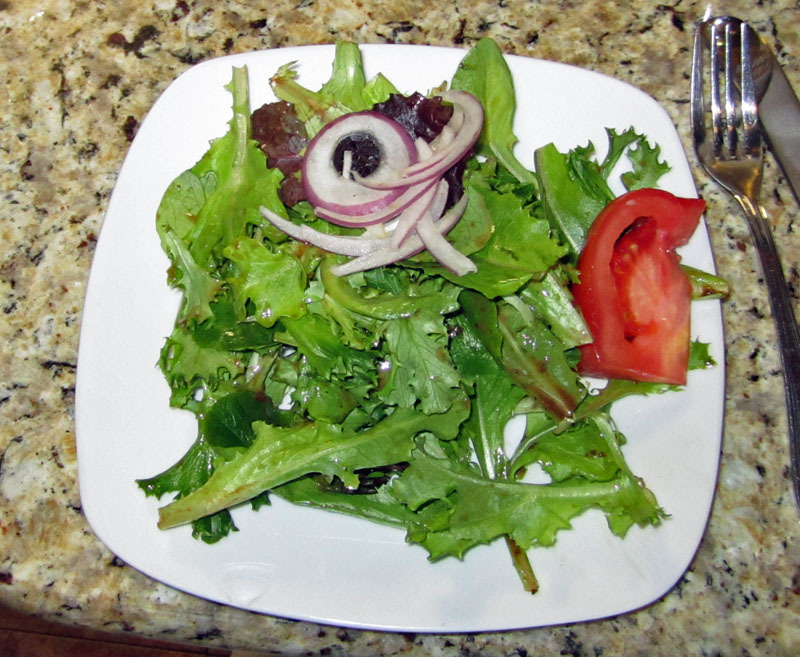 A bed of mixed greens was simply and lightly dressed, topped with a bit of red onion and a slice of tomato. Simple but elegant, with good flavor and very fresh ingredients. Yumm. In the meantime, between salad and our pizzas, we were given some wonderful bread with a plate of olive oil that had Parmesan cheese in it with a healthy drizzle of balsamic vinegar--it was very good, too--so much that we had a second basket of bread. For his pizza, my friend Tommy asked if he could have a simple pepperoni Pizza--something that was not on the menu. No problem! Victoria didn't even bat an eyelash. The pizza came out fresh and hot. As promised, it was a simple pepperoni pizza. Well, simple in composition, complex in flavor. 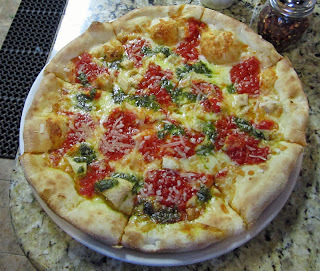 The crust was absolutely wonderful, the proportion of toppings perfect. The pepperoni was thick sliced and delicious. In all respects, this was a great pizza. He manage to eat 5 of the eight slices, but pizza is always a great thing to take home. For my pizza, I ordered the Genovese. This has chunks of tender chicken with dollops of pizza sauce and pesto, topped with cheese. 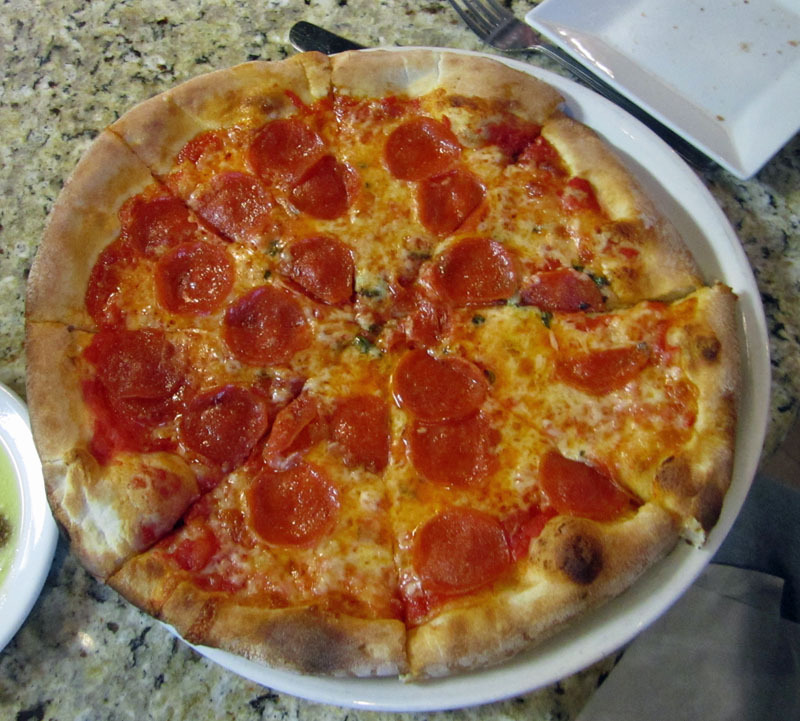 Again, the crust was outstanding--definitely home made and fired well in a nice hot brick oven. The pizza was wonderful, but I only managed to eat 5 of the 8 slices. All the better, because I had some to take home for the next day. Throughout our meal, we had a great view of the kitchen and drink station. I was amazed at the mostly silent coordination that was going on between all. Not a lot had to be said, but severs were helping each other along with the host, and everyone just seemed to know what to do with a minimum of words. The place was very busy both inside and out the whole time we were there. 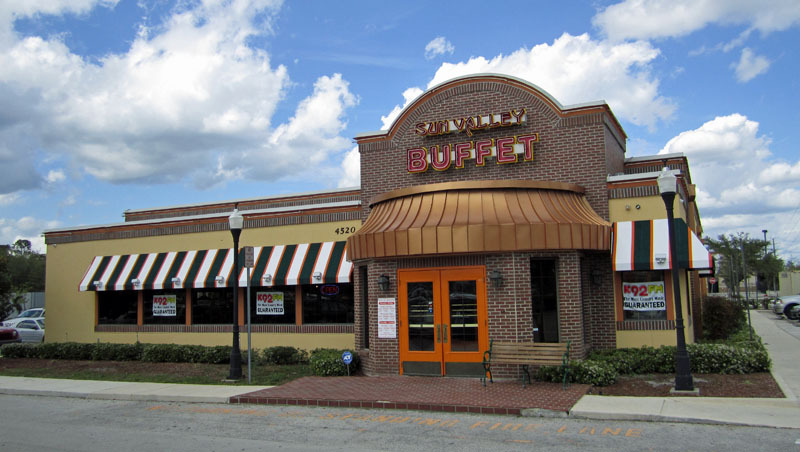 I've eaten here a few times and every time I have had good food and good service. I love it here and will be back again and again! We stopped in here for dinner on a recent Friday evening and were pleasantly surprise to find good food and good service in this new, sports-bar type place. I must admit, when I first heard of this place I thought "Hooters with an angle" and didn't hold out much hope for the food. But I was wrong. The meal and service we had here was excellent and I'd come back again. It was a busy Friday night, but we were seated immediately and within minutes our waitress appeared to take our drink menu. Our server, Leiann, was very good. She knew the menu and was able to field all our questions. 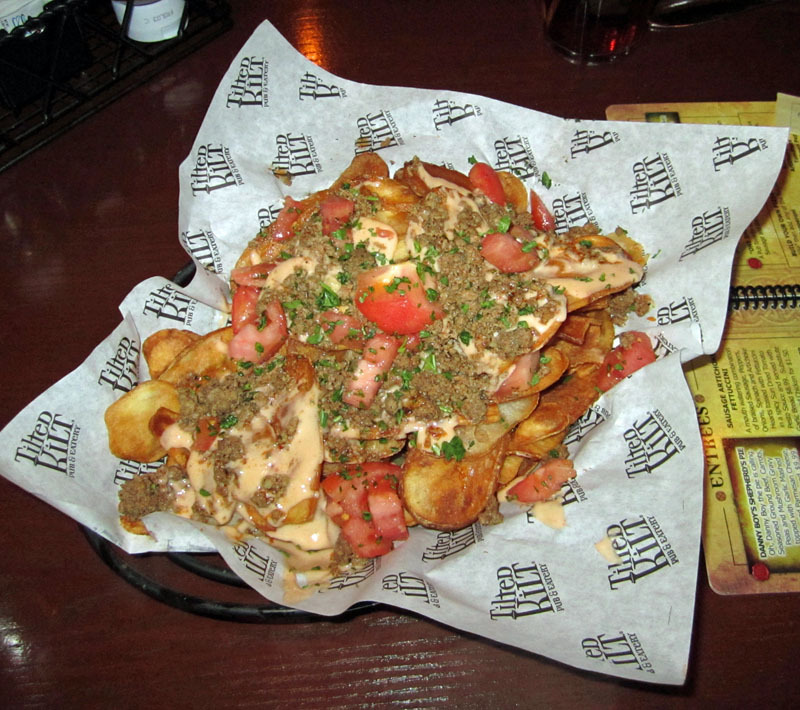 We started out with a few drinks and also the Irish Nachos. OMG! The potato chips that were the foundation of this dish were utterly fantastic--nice thicker slices of potato, still thin enough to be called chip but with some substance. The chips were covered with a cheese goo (ordinary), some ground beef, and tomatoes. But the real star of the dish was the chips, they were truly outstanding. I'm sure they'd even be good just by themselves. I'd order this again in a heartbeat. I started my meal with a salad. 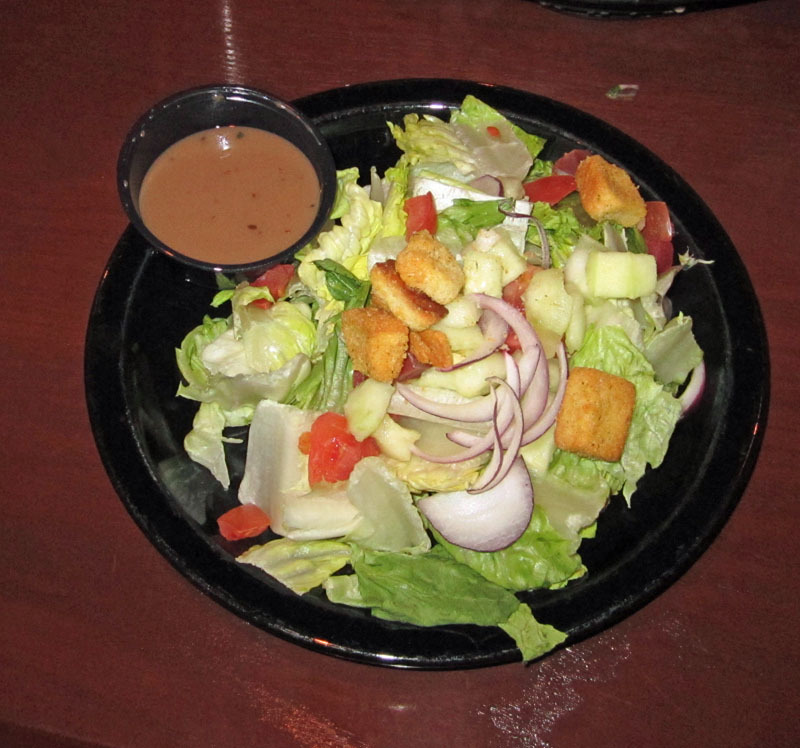 It was actually a very good salad, served with a balsamic vinaigrette on the side. Besides a nice bed of romaine, it had some sliced red onions, a bit of diced tomato, croutons, and some diced cucumbers. The cucumbers appeared to have been seeded--a very nice touch. It was a good side salad. 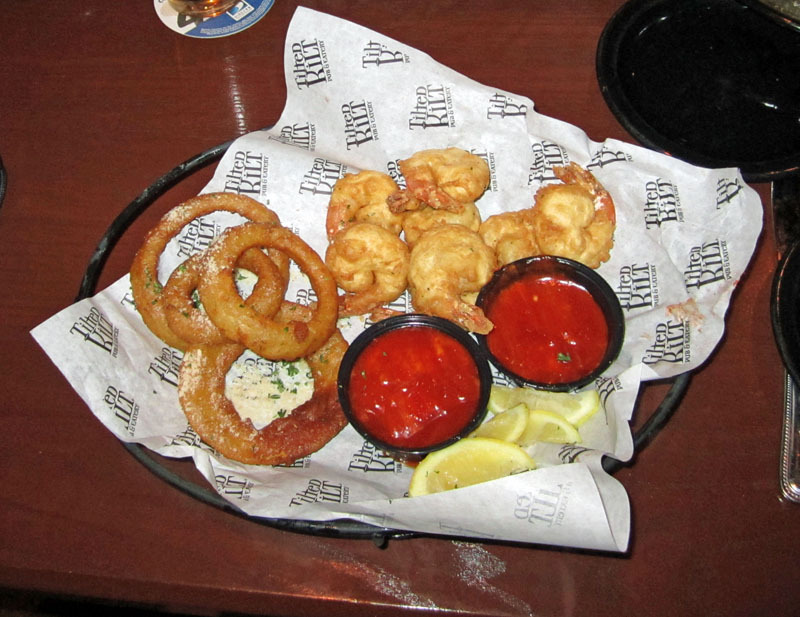 For my main course I chose the Ian's Shrimp Basket and asked for that with onion rings instead of the normal fries--no problem! There were about 8 decent sized shrimp that were breaded and deep fried. The shrimp were cooked perfectly. The breading was just a slight bit bready and did not hold onto the shrimp all that well--maybe they were a bit wet when breaded. But it was all very tasty nonetheless. I love shrimp and hate when they are not cooked right, but these were cooked right. Another hit in my book. 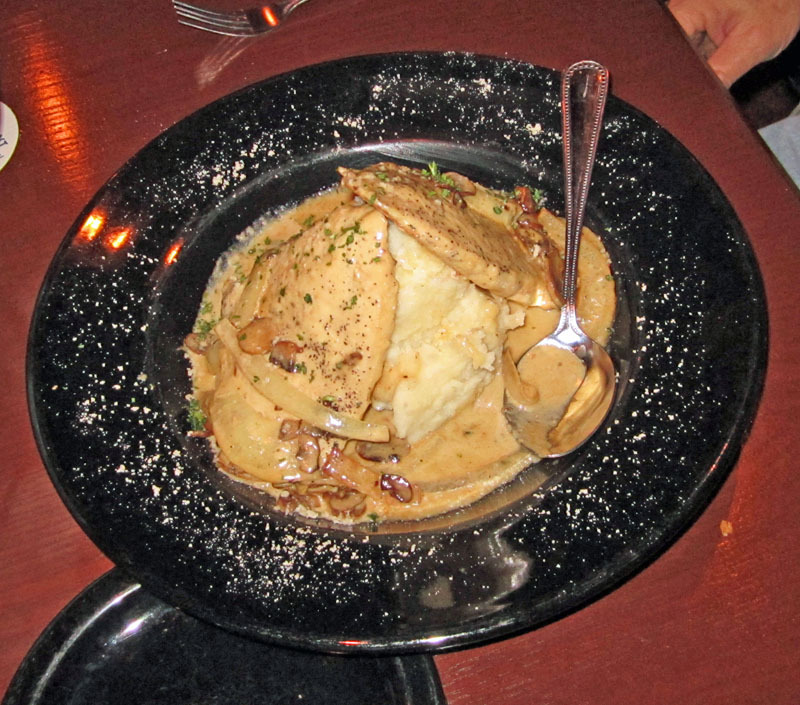 My Friend Tommy had the Gaelic Chicken--tender chicken breasts were sauteed with mushrooms and onions, served with a whiskey cream sauces, and set on a mound of garlic mashed potatoes. The chicken was very tender and the cream sauce very good. I'd say the potatoes were just ordinary, though, but overall it was a very good dish. 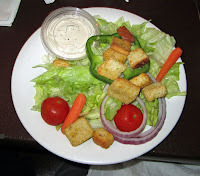 Throughout our meal, our server was very friendly, competent and attentive without being intrusive. That was very nice. This was my first visit here but I'm sure it will not be my last, based on this experience. Definitely good eats! I'm not a big Chinese buffet fan, but this place really satisfied me, and filled me up. And the food was pretty darned good for a buffet, too! Normally, when I think of a Chinese buffet, I think of things I would buy at Sam's club, then heat a whole bunch of and place on a steam table to let them get to a mediocre temperature and dry consistency. So when my friend Tommy and I decided to try out this new place the other day, I was pleasantly surprised--it was much better than that picture I had in my mind. First off, Sun Valley also has a small sushi bar and a small Mongolian BBQ, but I did not try them--next time. Secondly the selection--it was huge. I was impressed by the fact that the steam pans were not overly full, and each time I went back, there were some new things and some old things missing. This means that they are cooking in small batches and keeping things fresh, and that was my experience. Among all the things I sampled--and I sampled plenty--several things stood out. 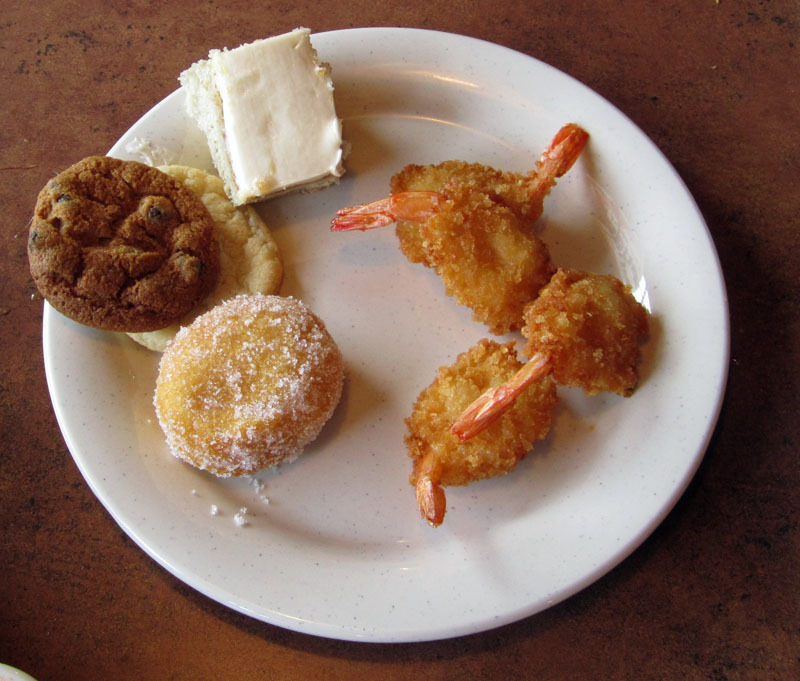 First and foremost, the fried, breaded shirmp. They were excellent. They kept coming out in small batches and so were always fresh, and the cocktail sauce they had certainly had a nice, hefty, horseradish kick. Very nice. Second, the potstickers. I was already about full when I spied these. They were exceptional. The meat filling was very nice, very flavorful. I got them just after they came out, and they were hot and flavorful. Quiet the treat, actually. There were a few "not quite hits" for me as well. Some of the chicken dishes were just a bit dry. The Bourbon Chicken, Orange Chicken, and General Tsos Chicken--all were just a bit dry. And the General Tsos lacked a nice kick. For the "American" Dishes, the BBQ pork was actually quite good. The Mac and Cheese was quite bland though. 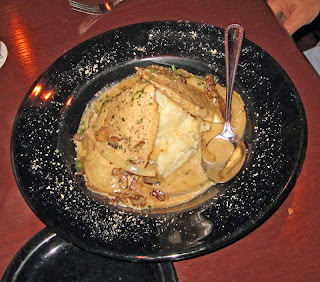 There were quite a number of other dishes that were hits, though, and overall, i really enjoyed the food I had. There was a nice salad bar a well with a lot of nice fresh fruit. I sure liked that. Our service was very attentive. Used plates were picked up very promptly. Overall, this was a good experience. At $12.99 for dinner and weekends, it's maybe a bit pricey, but then again, you get what you pay for. I will come back for the $6.99 weekday lunch one of these days, for sure. Oh, and they have some very nice desserts as well. As I said, the selection here is very good and very extensive. I'd try it again, for sure! 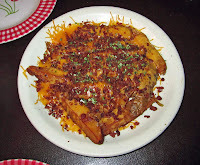 Based on good reviews on Urbanspoon,com, I went to Cattle Ranch recently. I was not disappointed. The food was generally very good, the service great, and I left with a full tummy and some more for another day! We arrived on a Friday night and were promptly seated, being give our choice of an area to sit in. It did not take long for our server to take our drink orders, and we quickly ordered a few appetizers as well. 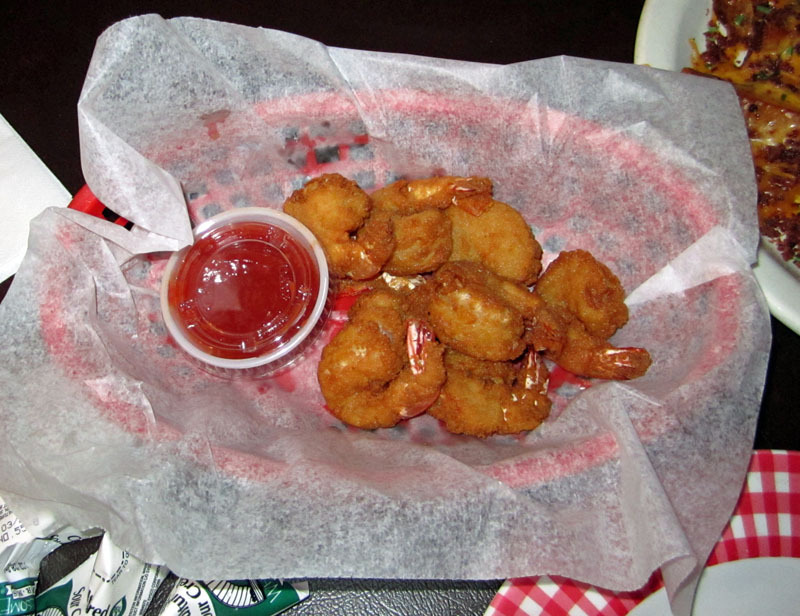 For our first appetizer we chose the Fried Shrimp. It was a good choice. About 8 good-sized shrimp had been breaded with a nice, crispy coating and them nearly perfectly deep fried. They were very good--fresh, hot, and cooked just right. They were served with a nice but standard shrimp cocktail sauce. I really liked these. For one of my side I had a salad. It was good and filling, all that a salad should be. I had the house dressing and it was very good as well. Nothing exceptional here, but still a very nice salad. 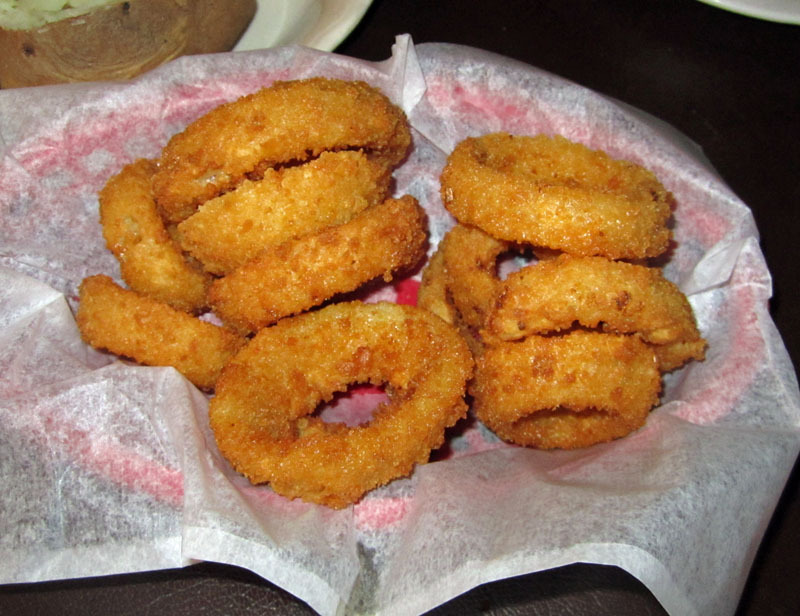 To go with our entrees, I ordered some Onion Rings. These were very, very good. They had a nice and crisp breading on the, and were very crispy, very hot, when served. I think we both agreed that these were among the best onion rings we'd had in a long, long time. 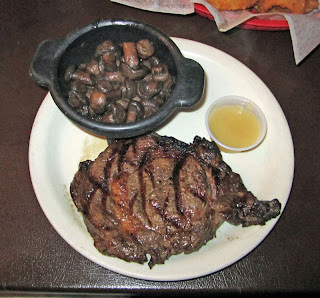 For my entree I ordered the Ribeye, medium-rare, with a side of sauteed mushrooms. My Ribeye was OK, but jsut OK. It was cooked just a bit shy of medium rare, for the most part, but parts were just past medium rare. Also, it was just a bit gristly. So, while it had great flavor, a bit of it was chewy, and a bit very good. I would say it was not quite butchered right, since it was not consistently medium-rare. Still, it had a very nice flavor and overall, I did enjoy it. The sauteed mushrooms were very good, and a large portion. I liked them a lot. 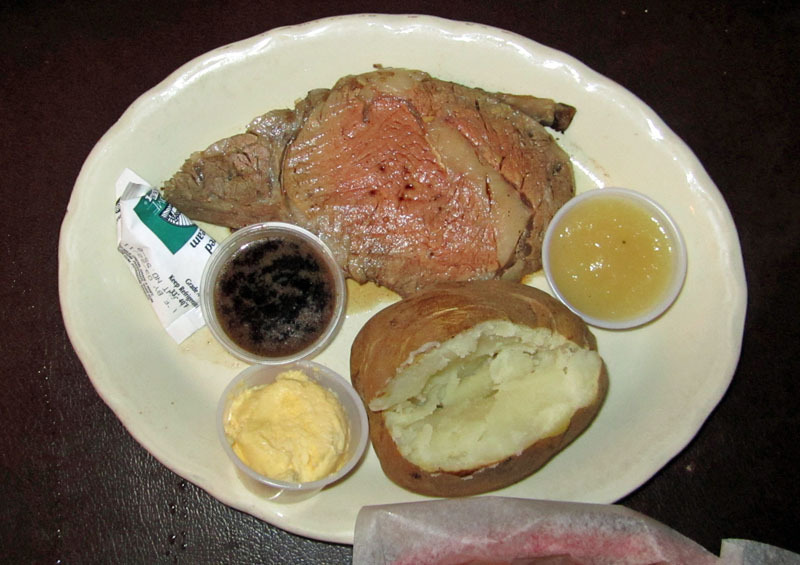 For his main dish, my friend Tommy ordered the Prime Rib. It was very good, a nice medium, with a nice flavor and quite tender. To go-with he had a baked potatoe. Again, is prime rib was very good, and the rest of the meal excellent as well. We enjoyed our meal here. It was very good, and we had good service. One think I would say about the decor--it reminded me of 1970. I'd say this place has not been remodeled in about 40 years. The interior is somewhat dated. Still, they know how to cook shrimp and how to grill a mean steak, so we enjoyed our meal here. I'd come back--what better compliment could I give? I'll be at Alive After Five this Thursday, March 10th, in beautiful downtown Sanford. So if you're in the area and up for a fun evening street party, join me, 5-8 PM. I'll be hanging out at Art Affair Gallery, but still enjoying all the great food and drinks up and down the street. Always a great time!